You may be familiar with the can can (sometimes spelled can-can), a high-energy French dance typically performed by an all-female chorus line of dancers, but in Puerto Rico, can-can has a very different definition—and it definitely does not involve dancing. Found in small and inexpensive restaurants called fondas, chuletas can-can (also spelled chuletas kan kan) is a style of pork chop (chuleta) with the rib meat, fat, and skin all still attached. It is called can-can due to the unique cut, but the restaurant responsible for creating the iconic recipe for chuletas can-can, La Guardarraya, is still in operation in Puerto Rico in the small inland village of Guayanilla. La Guardarraya still serves up their most popular dish almost on a daily basis. 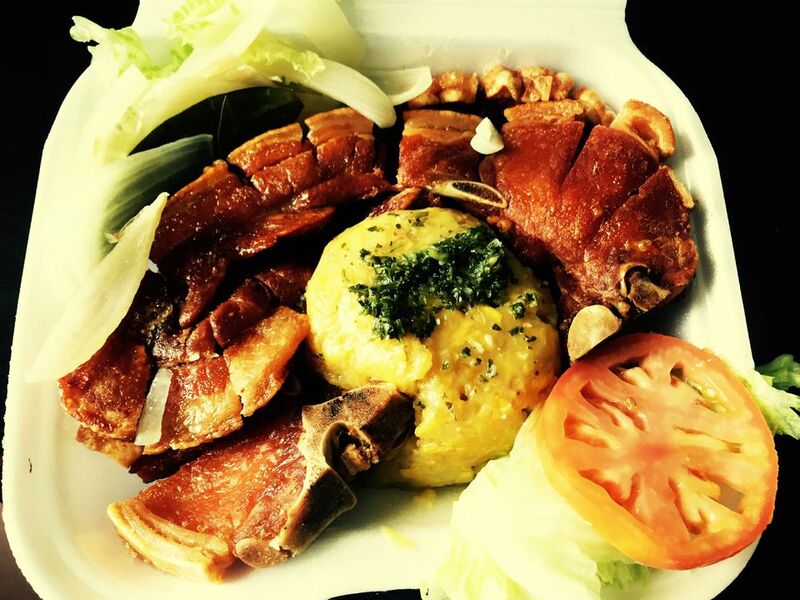 Beyond its restaurant origin, chuletas can-can is a great example of the diversity of Puerto Rican cuisine. Blending cooking styles from Europe (particularly Spain), Africa, and other parts of the Caribbean, traditional Puerto Rican dishes are a perfect blending of the melting pot culture. Preparing chuletas can-can begins with marinating the fresh meat in a mixture of cilantro, oregano, vinegar, onion, paprika, and garlic with other local ingredients. One of these local ingredients is annatto, an orangey-red ground spice derived from the seeds of the achiote tree—which is sometimes referred to as the lipstick tree due to its usage in body paint and other cosmetics—and an alternative to pure annatto is sazón which combines achiote seeds with cumin, coriander seeds, salt, and garlic powder. After marinating, the chuletas can-can is then deep-fried, an essential process that forms the incredibly tasty layer of chicharróns (also known as pork rinds) on top of both the rib and the pork chop that is a signature part of this dish. The rib, chop, and rind combination is usually served along with rice and beans and fried plantains. Chuletas can-can is just the beginning of the tasty trip of delights that is Puerto Rican food. From the high-quality coffee culture to comforting holiday foods, and the strange, and even sometimes bizarre dishes, there is something for ever palate to sample, whether you are adventurous, a foodie, or have simpler tastes. With influences from cultures including Taino Arawak, Spanish, American, and African, Puerto Rican cooking—called cocina criolla by locals—gets its uniqueness from its local ingredients and preparation choices. In fact, the first cookbook of the island, "El Cocinero Puertorriqueño," was published in 1849 and features some of the world's first references to cooking with many of these ingredients. In more modern times, beginning sometime in the 19th century, Puerto Rican food increased its scope of influence to the United States and parts of Asia, particularly Chinese and Japanese cuisine. Thanks to the unique spices of this island country, these Puerto Rican traditions have seeped into nearly every chef's kitchen around the world. Although found elsewhere around the world, especially in similarly tropical climates to that of Puerto Rico, coriander, papaya, cacao, nispero, apio, plantains, and yampee are all staple ingredients of Puerto Rican cookbooks that have made their way into other nations' cuisines.